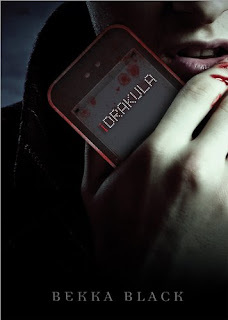 Bekka Black’s new novel iDrakula (Sourcebooks Fire, October 2010) retells Bram Stoker’s classic epistolary story entirely through digital communication, including text messages, email, and websites. This “e-pistolary” format itself is still unusual, but it’s quickly gaining ground, particularly for teen readers (see Elizabeth Rudnick’s Tweet Heart, published in June). Sourcebook’s iDrakula app for iPhone and iPod Touch manages to fill in some of these gaps without limiting the reader’s interpretation. 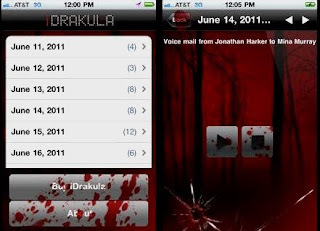 The app — a hybrid of e-book, cell phone novel, and radio play — incorporates the whole text of the novel, plus additional audio of phone calls and voicemails between characters. Content opens day by day for fifteen days to unfold the plot in real time. (Impatient readers can opt to unlock everything at once.) The one-day-at-a-time pacing and the act of scrolling sharpen suspense, though users unfamiliar with the story may be confused by the way some messages open out of order. The blood-spattered, cracked iPhone image of the app lends a sense of foreboding to even innocuous messages. Like Loser/Queen, it remains to be seen how the paperback itself will fare. Readers who encounter iDrakula in paperback will probably seek out the app for additional content, but I doubt the app with its extras will promote sales of the physical book. I hope that readers thirsty for more after reading Black’s retelling in either format will seek out Stoker’s novel (if they haven’t already) to really scare themselves silly. Available for iPhone, iPad, and iPod touch (requires iOS 4.0 or later); free. Recommended for teen users.